"Once again" also means "he just won't give up". This doctor told me to make the appointment! "He still feels that . . ." subliminally says, "he mistakenly feels that . . ."
"He brings in pictures" - use of present tense to make it seem ongoing as a way to exagerate. "He feels that his collumella was lower and his tip was lower." If this means my nose was longer, yes. See the pictures. It's amazing how blind the doctor can be compared to plastic surgeons do not know if they can fix the extensive damage. "If you look at the collumella . . ." means, "hey, don't take my word for it . . ."
"I told him I could not make his tip any more solid . . ." Of course he cannot make it any firmer! Other plastic surgeons doubt they can fix it also. I may be wearing a splint on my nose for the rest of time. "Normal limits" for what person? "From the OP report, nothing was changed." Again, the very obvious truth has been omitted from the report, and using the incomplete report rather than examining the physical evidence is making a false statement based on a false report. I have been very clear. I want my nose "unchanged" back to how it was before the inappropriate cartilage removal. "To enlarge this, I think would be contraindicated", he says. Why? "I placed bolsters under. . ." Reality check: whenever I put a Q-Tip up my nostril, my breathing is really improved! As I said in the previous page, I wasn't given any time to evaluate how he placed them. "good airway" is absolutely false. The sides of my unsupported nose flap inward very easily. Any amount of air intake causes collapse! I closed my mouth and breathing slowly in. The sides of my nose collapse easily, an it looks the same as if I were a normal person breathing in rapidly. This doctor is very good at propoganda and is insulting! But it is easily disproven! 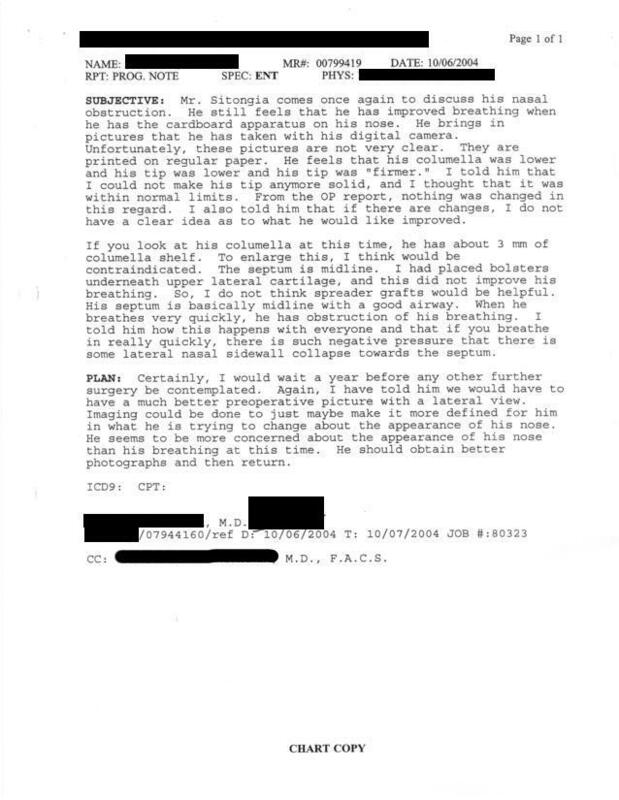 "He seems to be more concerned about the appearance of his nose than his breathing at this time". O.K., he just drops the reframing of what I say since I am not cooperating anymore, and just puts the LIE that he wants in the report. I brought enlarged B/W printouts of photographs I had where taken before surgery to document a haircut I liked. I also brought pictures of "after surgery" taken from the same angle. I brought them naively hoping he would see the physical evidence that something wrong was done to my nose. To demonstrate the nasal congestion while the device was not attached, I breathed through my nose normally as I would while sitting in a chair (slowly), and it was congested. In response, the doctor breathed in through his nose rapidly enough that it made a similar congested noise, but the comparison was not the same. I was then that I fully realized that I was dealing with predetermined bias. The doctor then took his nose with his fingers and moved it side to side, and said, "Look, I can move my nose too!" I replied, "But I don't want your nose. I want my nose." I was getting plenty tired of being treated as though I where a child playing games. At this point the doctor collected himself and dropped the patronizing attitude toward me. I showed him the pictures I brought, and the doctor said he couldn't determine much from them. The doctor then took a slender instrument and pushed sideways against the middle (septum part) of my nose until it contacted the the solid part of the septum now recessed back inside my nose. He then discussed with me the possibility that I might get better pictures and return. The doctor seemed intent on reframing my concerns about the missing cartilage as though I was concerned about my appearance. I agreed, but I re-directed the subject to the cartilage removal regarding the pain and breathing problems. The doctor would not respond to statements or questions in which I mention the cartilage removal. He kept saying how hard it is to correct appearance to the millimeter. Again I was not concerned about millimeters, this was another defensive reframing attempt. I bet this doctor was quite the manipulative bully in his younger days. He should not get away with this.